This week, I unpacked all the Spring clothes I put away at the end of the season last year. As I pulled out a pile of colorful floral dresses, I couldn’t help but think, whose stuff is this? Some of them I do feel attached to. Like this vintage beauty I bought around my birthday a couple summers back. I have no desire to get rid of it. But others, while objectively pretty, just didn’t speak to the way I feel about myself. There was no coherent story there, no picture of me in that jumble of loud colors and prints. That’s why, this year, I’m focusing my little capsule wardrobe around a palette that does feel like me. I want to open that box next year and feel like I’m returning to old friends. 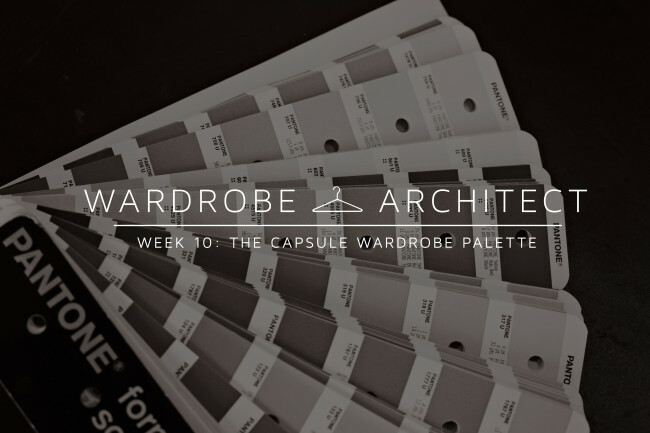 Remember in week six when we built color palettes that reflect our own tastes, personalities, and preferences? I decided to use that to narrow down a palette for my spring capsule wardrobe. 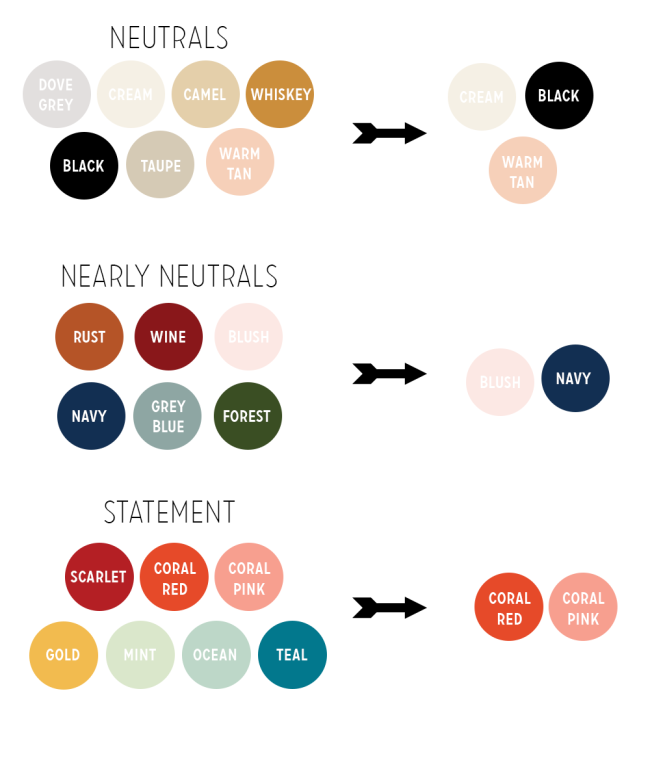 I chose a few colors from each category: neutrals, nearly neutrals, and statement colors. I left off the metallics because, for me, those don’t tend to ever change. You can include them if you like. My statement colors are the brighter reds and coral pinks which I tend to wear on my lips and nails, but I might include them in my clothing too.If you love bright colors, you can definitely lean more heavily on this category. Just remember that the more neutrals you include, the easier it is to mix and match for most people. So this is my spring and summer palette. The beauty of this approach is that, because I’m choosing from a palette of my favorite colors to begin with, there’s likely to be a lot of overlap both between seasons and between years. In other words, when I plan a new capsule wardrobe next spring, the chances are high that I’ll include a lot of these colors again. That will make it very easy to mix in things I already have! And remember, not everything you wear has to fit into your capsule wardrobe. That vintage dress above? Totally not in my palette. But I’m sure I’ll still wear the heck out of it. I think of the capsule wardrobe more as an organizing device to bring a little more thought and coherence to what I make, not as some strict wardrobe diet I have to stick to religiously. Choose your capsule palette for the season. Use the list of favorite colors you came up with in week 6, picking a few colors from each category. Next week, we’ll start deciding what we actually want to sew! Have you ever limited yourself to a single palette before? How did it work out for you? I have to say, it’s really made me excited about sewing up this mini-wardrobe. I worked on this a bit last night (I peeked ahead on Into Mind!) but now I’m a bit stuck. My two favorite colors are blue and pink, which don’t “go” together. My palette is sort of divided between blues/greens and pinks/corals. Should I stick with one group for a season, or just deal with the fact that I’ll need more pieces? I can’t see myself excluding either group of colors! You can totally make blue and pink work together. You just have to designate one as the neutral, like wearing navy and hot pink or navy and a pale pink, or a bright blue with a paler pink. You can also wear both as bright colors if you break them up with a neutral, like a blue skirt, white shirt, and pink scarf or shrug. Experiment! Coral pink looks really nice with a mint green or duck egg blue. I current have bright punk hair and navy is probably my favorite color to wear with it right now. Blue and pink definitely go together. I have actually started this too. I decided on my overall theme, decided on key pieces to make and the other day went fabric shopping with a plan and actually stuck to it. My colour palette is red white and navy because it always looks smart and classic. But because I am a bit nuts when it comes to colours, I am throwing in some emerald green and mustard. I tend to use mustard as a neutral. It does feel good to have an overall plan for the season. But I do love bright colours so much I will have to mix it up a bit. I know I’ve said this before but I love this series!! I’m having so much fun with this…tonight I’m going to sit down and catch up/organize myself on this project; I’ve been doing it kind of piecemeal but I think having it all in one spot will be good. I’m actually thinking of making a physical moodboard so I can have it close by in my sewing room. On another note where are those sandals from? They are SO cute! I think this will be the year I finally break down and buy actual good, comfy sandals instead of the cheapest something halfway through July. Those sandals look like Swedish Hasbeens, which are a bit spendy but SO comfortable and they last a really long time. I just bought another pair to try to wean myself from adorable-but-flimsy Target shoes this summer. I hope it works! If you ever get to the Minneapolis area, you should go to the Sven warehouse, where they are made. You can score pairs for $40-60! I’m so glad to have another cute clog source! And I think a road trip to the twin cities might be in my future, so I’ll be sure to add the warehouse to my itinerary. Thanks! rooted through the closet last week, and everything that wasn’t black, white, grey, cool blues, lavender went out the door. all the brown, orangey-reds – gone…. either to my sister, or the fashionproject.com. great book… for thinking about a lot of things. my museum visits are all the richer for having pored over this, too. I really love the colours you have picked for your spring palette and your method for choosing them was very inspiring. I created a capsule colour palette last summer to help me pack for my honeymoon, and it was brilliant. I picked white, black and navy as my neutrals, making sure I had basic pieces in these colours (dresses, shorts, skirts) and then added bright pink and electric blue as accent colours (shoes, scarves, purse, jewlery – or they played a role in the fabric patterns of my clothes…Oh and I may have had a pair of bright pink shorts in there too!) and it worked out brilliantly! I was able to mix and match everything in my suitcase. I ended up not bringing half as much as I usually do on holidays, but felt like I had twice as many options! I will definitely be taking this approach for future trips – and for future sewing plans! 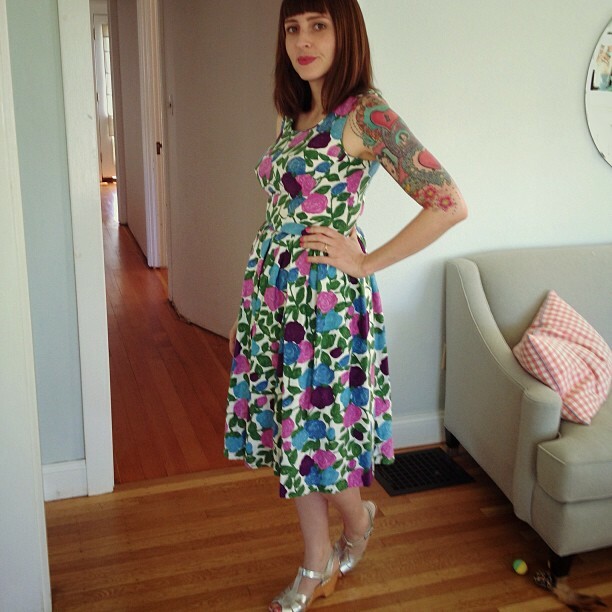 I more or less did this for my honeymoon last summer, too– it really came in handy partway through the week when I needed to re-wear some things and could still make different outfits! Have you created the colour swatches yourself or are they available on the net? I should like to put my colours in one place and actually see the colours rather than have the words written down. Really getting into this now! I just used photoshop. You can use any application that has a color picker… even microsoft word! Thanks! i think that is beyond me so i shall just enjoy looking at yours! I have been very inspired by this series so thank you. My summer palette is…. my neutrals are an warm beige and an ivory white. My nearly neutral is navy (since I love blue). I’m still working out my statement colors, but red is one of them. I did try it once– I was attempting to make a mini-wardrobe for the summer based on the colors in one knit print that I fell in love with. A big part of the issue I ran into is that I was sourcing all of my fabrics online, and the colors ended up not quite working together–the brown was too red-toned, the taupe was too grey, etc. The end result was that I didn’t finish the mini-wardrobe project, and the only things I still have from it are the dress and top from the knit print, and one solid ivory knit top. I hope this one goes better! I’m stashbusting this year, and I do already have a couple of projects planned for the spring and summer. 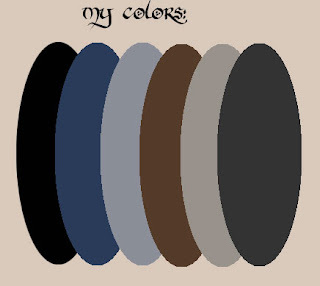 So I think what I’m going to try to do is focus on pulling colors from what I already have in mind, and that way if I do need to buy some things, I have a concrete color scheme to match them against. The colours you’ve picked for your spring palette seem really “you”! When I picture the clothes you wear in blog posts, those are the colours I remember! To Beth who worried about pink and blue not going together–try denim as your blue, as in jeans, jean jackets skirts etc as the blue (navy) and voila it will work! 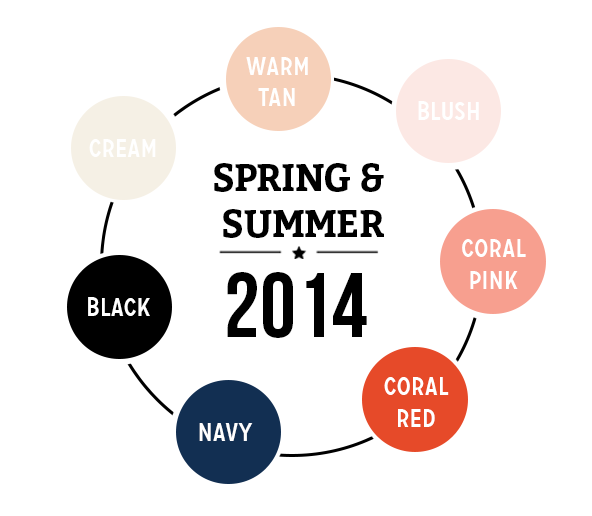 I’ve been working on my Spring wardrobe with a short list of colors in mind. Indigo and white are my neutrals, greens are my mid range, and here I mean pretty much any shade of green. Green is my magical color! No matter what shade of it I wear, it seems to match my eyes perfectly. My statement colors are magenta and warm red which both make me feel happy and uplift my complexion. It would be fun to put them in a palette. I’ll try to do that today and post it to my blog. I started sewing off of a color palette last year and it was such a good decision. It helps make the overwhelming amount of choice that is available to you when you sew so much easier to manage, and keeps me from buying fabric that I don’t need and/or really can’t afford. Also, colors like mint green, navy, and red tend to carry over from season to season for me, which gives my clothes more mileage. That’s part of what I really like about color palette sewing- it makes all of my clothes match, especially if I choose all colors that I think look good together. I recently dyed my hair pink, and it’s been so much fun planning my spring/summer clothing around it as the centerpiece of my spring/summer color palette. This year I’m going to work with a bright fuchsia (that matches my hair), purple, navy blue, mint green, and a pastel pink. Black and white is also factored in, as those are my main neutrals that tend to carry over for me from season to season. I also love a black and white outfit with a bright pop of color. Navy also counts as a neutral for me- over the past year, I’ve been reaching for navy more and more in place of black. In my 50s, I’ve found that it helps to pick a seasonal neutral; for me, black in winter, stone in summer, olive/brown in fall (usually for pants or skirts), and then it’s easy to put on a colorful top, jacket or wrap to go with it. Too much mixing and matching gives me anxiety and this makes it simple. My “makes” are usually colorful vintage-style Chanel jackets, couture fabric tops and 50s designer wraps that work well over black for nights out. If all else fails, I have a collection of Hermes scarves from eBay and 40s Mexican silver jewelry, and they’ll dress anything up in seconds flat. Thanks for this insightful series! To anyone looking for shoes: onlineshoes.com is a great site for shoes of all kinds and also boots(my favorites) . They have good quality and also good sales all the time. I’m hooked!! I love your website!! I love playing with colors! Can´t wait for next week! My only attempt at a cohesive palette was VERY successful. I chose tan, olive, rust and limited variations on these. Literally everything I owned went with everything else and I always looked put together and felt good. I had one friend who harassed me for “never taking a chance” until I thought I must be doing something wrong. I have just never managed to get myself together enough to try it again. Maybe this year. So I’ve cheated a bit and added three colour variations from my palette from a few weeks ago… just wanted it to be a bit fresher. Can’t wait to put all this into practice! I’d like to try organizing my palette this way. Do you have a link to your color swatches? That would make the process easy to duplicate.